The Gundagai Tigers grand final celebrations may be winding down but four horses that carry the club’s colours on Sunday may well reignite the party. One week after the Tigers defeated South City in the Group Nine rugby league grand final four horses, three of which figure prominently in betting markets, will represent Canberra trainer Todd Smart. Old favourite Attainment along with maiden gallopers Tobermory and Eurosay as well as Spare Ticket will represent Smart in the back and gold colours of the Tigers. The quartet all have a connection to Gundagai in their ownership and Smart is hopeful of one or two wins providing the track doesn’t work against two of his runners. Tobermory, which is raced by members of Smart’s family and some friends, has finished second, third and fourth from three starts. It’s a similar story with Eurosay – a lightly raced gelding who is also close to breaking through for his first win after being close-up in recent starts. Heavy rain across parts of the region on Thursday will have some impact on the track which will suit Smart’s other two contenders, especially noted wet track performer Attainment. Smart believes Tobermory has the potential to be one of his best horses but is still on a learning curve while Eurosay falls into the same category. 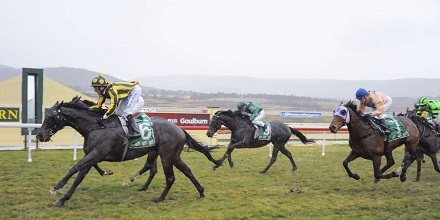 Attainment won his last start in trying conditions at Goulburn. Credit: Bradley Photos. Eurosay (third) and Whose Shout (fourth) ran creditable races when close-up at Wagga at their latest starts. The query runner is the top weight Medeus who was previously trained in Sydney and has only had one trial which was one year ago. He is prepared by Joe Curran who has recently returned to training after an absence of close to 20 years. While Smart still has unanswered questions about the wet track capabilities of Eurosay and Tobermory that doesn’t apply to Attainment. The eight-year-old won on a soft track at his latest start at Goulburn and prior to that was unplaced on a heavy surface at Albury behind noted wet track specialist Gentleman Max. Attainment has a lot of ground to make up on Gentleman Max from that outing and will carry 5.5 kilograms less than the top weight. “The rain puts him right into the race as it does for Gentleman Max. He just gets through it like no other horse so if it becomes heavy he will be right in the finish,” he said. Spare Ticket has the task ahead of him from the outside gate and hasn’t shown up in recent starts with Smart suggesting he will need the race run to suit. “He does love the wet so if he can put himself in the first four he is a chance,” he said. Eurosay is listed as the favourite, Tobermory second favourite, while Attainment is at decent each-way odds and Spare Ticket is an outsider. Smart is rightly adopting a wait and see approach with his quartet. View the fields and form (including race replays) for Sunday's Gundagai meeting here.